Erica had her first appointment at MD Anderson Cancer Center in Houston, TX in early 2010. We were lucky enough to be assigned Patrick Hwu, MD as her Medical Oncologist. Luckily Erica has been able to continue seeing Dr. Hwu as her Medical Oncologist to this day. He is an amazing doctor and man. We have been extremely blessed to have Erica under his care, especially with the current Stage IV Metastatic Melanoma battle. We traveled to Houston for MD Anderson Cancer Center appointments on 3/19/19. It was a long day but the appointment times made it so we were able to drive there and back in the same day. We headed out at 6:15 am and arrived back home about 8:00 pm. Harvey IV and Braxton went with us this time. The first appointment was for an MRI of the head. At the second appointment they had the MRI results and we went over them. The prior bleeding around the brain tumor site has cleared up well. They were able to get a good look at the tumor this time. The radiation specialist doctor said everything looks good. The tumor is showing signs of dying off and she expects it is now under control. We tried to clarify if she expects that it is gone for good and couldn't get a real straight answer on that. From best I could decipher the radiation did a good job and they don't expect it to grow anymore. Ever since the previous MRI showed blood around the radiated area she has been taking double the dose of hydrocortisone totaling 60mg a day. The increase in the steroid medication was meant to help the brain eliminate the residual blood and heal faster. She is now going to reduce that back down to 30mg a day. You have to lower the dose very slowly so that there are no side effects. It will take a few weeks of slowly lowering the dose by 5mg each time. The response to treatment since last April with the stage 4 diagnosis has been amazing. At the moment everything is very stable and we are set to return to MD Anderson in about a month for a full checkup. They are doing a PET CT scan of the chest and abdomen next trip. Then we will see the medical oncologist. Looking forward to a positive visit! Erica has been at work full time this school year. She has had a few days where she Just needed to stay home and rest. On the day that she goes for the nivolumab infusion in Fort Worth, every four weeks, she leaves work about 2:00 and that has been on a Thursday each time. ​I truly don't know how she does it, she is so strong willed and almost dare I say relentless. I am amazed by her and she is so amazing! The stomach pain persists on most days and she just carries on, able to act like nothing is wrong most of the time. The stomach pain is something we don't have a clear understanding of, but it is more than likely a side effect of the immunotherapy. That's all I have for now. We'll update after next appointment in April. Thanks again for all of the loving thoughts and prayers! Luckily the original five brain lesions I had, when diagnosed with Stage IV Metastatic Melanoma in April 2018, were eliminated with the help of the intravenous treatment of ipilimumab and nivolumab combination immunotherapy. There was originally conversation about proceeding with Gamma Knife Radiosurgery on those five brain lesions. That was the most effective response to the initial immunotherapy treatment. The other lesions, or tumors, in my lungs and liver were shrinking, but not eliminated the way the ones in my brain had responded. So it was a good call by my Medical Oncologist to hold off on the Gamma Knife and see how the brain tumors responded to the immunotherapy. Unfortunately a scan months later showed a new tumor in my brain. This time Gamma Knife Radiosurgery was being called for right away to use radiation on the tumor. My Medical Oncologist didn't seem very concerned, stating he thought the Gamma Knife procedure would zap it right away and that would be that. It was comforting to think of it as such a definite solution. So my husband Harvey and I set off for the next journey in all of this. It's always unsettling when you are posed with new information and procedural details related to a new diagnosis or treatment. Of course we immediately turned to the internet to do our own research about the procedure. With a wealth of information online we were able to understand that the procedure involved placing a frame on the head that allows a specialized bowl looking device to be attached to the frame. With the frame mounted to the skull with four pins, there would be another MRI done so that the alignment of the exact location of the tumor could be calculated. They could then customize the bowl looking device so that only certain pin point locations on it would have radiation pass through aimed at the exact location of the tumor. There are roughly two hundred beams of low dose radiation that can be used. When each of the beams of radiation come together in the exact location of a tumor it provides a high dose of radiation in that exact pin pointed location. So we started the appointments to prepare and the first step was having a consultation with the Radiation Oncologist. She reviewed the prior MRI and discussed the details of the Gamma Knife Radiosurgery procedure, including just about everything we had already learned online. It was pretty straight forward, we would arrive very early the morning of and after completion of the procedure there would be a couple hours of observation before being released. The main concern to be watched for after the procedure is bleeding in the brain around the tumor site. There are other potential side effects, but based on the location of my tumor she didn't seem to think I would experience any of them. The next consultation appointment was with the Neurosurgeon. The Neurosurgeon is who places the frame around the head and tightens the four pins to the skull to hold it in place. We were told that because the pins go through the muscle, tension headaches and a feeling of tightness around the skull was the most common thing to deal with post procedure. They also talked about the potential for what looks like bruising around the eyes within a few days following. We felt that we understood the Neurosurgeons part and that was that. Midnight before the procedure day was the cut off for eating or drinking anything other than water. We arrived at the MD Anderson Cancer Center main building at 6:15 am to begin preparation. They had given me a medical scrubs outfit prior so I arrived wearing that. The very first step in the process was having the frame installed on the skull. They injected a numbing agent in the four areas that the pins were to be screwed in. The installation wasn't painful, more of a sensation from the pressure being applied to my skull. It was scary having something screwed to my skull. A Xanax taken prior helped a little with the anxiety of it all. Straight from there we headed to get the new MRI of the head so that the frame positioning could be calculated. Apparently they take a specialized approach to the views captured in this MRI, since it's used for programming and setup of the Gamma Knife machine. It took a little longer than a typical MRI of the head. Now it was on to get as comfortable as possible in a bed with this metal apparatus around my head. This was also where they said I would return after the procedure. I had previously placed an order for food that arrived once I was laying down, so I was happy to have some breakfast while I waited. Within about an hour it was time to head to the area where the Gamma Knife procedure is done. I waited about thirty minutes for my turn and then they had me come in for an initial double check of everything. After that it wasn't long before it was my turn for the procedure. If I remember correctly there were six patients in rotation for that days Gamma Knife procedures. They said that was a pretty low number and that they often have as many as a dozen. The Gamma Knife machine looks kind of like a scanning machine. The bowl looking device was placed on my head and I was slid into position on the bed that rolls into the machine. They got my head positioned and everything set to start. It took about 30 minutes to complete the procedure. The Radiation Oncologist and the Neurosurgeon were present throughout the procedure along with multiple other technicians. As soon as I was done in the Gamma Knife machine they took me to another room and the Neurosurgeon removed the frame from my skull. Back to the bed I had been in previously and to my leftovers from breakfast. I didn't feel anything during the Gamma Knife procedure. After the frame was removed I felt a relief of the tension from the four pins. So I snacked a little more and then fell asleep for a while. About two hours later they started preparing to release me. We were staying in a nearby hotel so we only had about a five minute drive. We typically stay in Airbnb lodging, but for this trip we wanted to stay as close to the hospital as possible since we had to arrive so early. We made our way back to the hotel about 2:00 pm and went straight to sleep. When I woke up several hours later I had a pretty severe tension headache. The best way I can describe it felt like a very tight rubber band around my head. We tried to sleep some more and about 8:00 pm Harvey woke up and asked if I was hungry. Unfortunately the day of the procedure fell on his birthday. We ended up ordering some delivery of good Thai food. Luckily they also had Harvey's favorite carrot cake, so the day was saved for the birthday boy having his birthday dinner and cake in our hotel room that night. Because we live about four and a half hours from the hospital, the doctor asked that we stay locally for twenty four hours after the procedure. The next afternoon we loaded up and headed home. In the days following the four points that were penetrated on my head were very sore and I continued to have a headache with the sensation of tension, like a rubber band around my head. That lasted for about ten days. Roughly a month after the procedure I experienced some very severe headaches and nausea. I ended up contacting MD Anderson to tell them about the symptoms and they wanted me to get an MRI of my head right away. Apparently they were most concerned about the status of my pituitary gland in my head. The MRI returned nothing abnormal related to the pituitary or anywhere else. They decided to start me on Hydrocortisone, which is a form of steroid, to help with inflammation and also help stimulate the production of cortisol. Various uncomfortable symptoms occurred in the weeks following. The most concerning was a feeling of numbness in my right foot and leg. Almost like the sensation when your body part goes to sleep and has a tingling sensation. The problem with symptoms, when your going through cancer like this, is you don't know what any particular side effect may be coming from. Having the effects of ipilimumb, nivolumab, morphine, steroids, and radiation to name a few, it is very difficult to know for sure what side effects could be related to. We returned to MD Anderson roughly six weeks after the Gamma Knife procedure for follow up scans. The great news is there was no evidence of new disease and there continued to be some shrinking of various tumors among the rest remaining stable. Although, in the MRI of the brain they were unable to clearly see the formerly radiated tumor site. It was surrounded by blood that was making the whole area cloudy in the images. I already had a follow up appointment scheduled with the Radiation Oncologist a week out, so I had to wait and return to Houston to discuss the brain portion with her at that appointment. At the appointment with the Radiation Oncologist she reviewed the symptoms I'd been experiencing with headaches, nauseous episodes, and numbness in my right leg and foot. She determined that she suspected a blood vessel had broken around the tumor that had been radiated. She felt strongly that the date in December that I had experienced a rapid onset of those symptoms correlated with when the blood vessel had ruptured causing the blood around the site of the tumor that was treated. The good news was she thought the numb sensation would go away as the brain heals. I had my Hydrocortisone dosage increased immediately to help my brain clear the excess blood. The plan was set for me to return for another MRI of brain in about 45 days, in hopes the blood will have cleared for a clear view of the tumor location that received the Gamma Knife Radiosurgery. Looking forward to hearing that the tumor was destroyed and only scar tissue is left, fingers crossed! That was my experience undergoing Gamma Knife Radiosurgery for a brain tumor at MD Anderson Cancer Center. I have to brag on MD Anderson every chance I get. Although the whole experience of Gamma Knife is quite an ordeal, they made everything straight forward and I felt completely informed. The process itself was obviously arranged to be as pleasant for the patient as possible. Every employee and doctor there are so caring. We are so thankful to have the resources they've provided in this journey fighting Metastatic Melanoma since March 2010. No significant news at the moment! The Gamma Knife radiation procedure on my brain appears to have went well back in November. When we went to MD Anderson in January and they were unable to see the brain spot they radiated because it had blood around it. They feel confident the tumor was destroyed, but we are going back in March for another MRI to see if they can get a better look (hopefully the blood surrounding the area will have dissipated). The great news is the scans in January showed no evidence of new disease and all tumors were stable. Stomach pain and headaches is the only real issue I'm dealing with as of late. I had my monthly Nivolumab infusion today and I'm usually a little fatigued for a few days following that. I attached a picture of me at the Gamma Knife procedure, quite an experience let me tell you. Thank you for all your continued prayers and well wishes! The initial immunotherapy treatment of Ipilimumab and Nivolumab was slated for four rounds of infusion, each three weeks apart. The first one was administered as an inpatient at MD Anderson about a week after initial diagnosis (back in April) of Stage IV cancer of lungs, liver, brain, and a couple of other random places. There were ultimately two more rounds of infusion at MD Anderson (for a total of three) before Erica's liver began to shut down. They identified her liver enzymes were way out of whack, so in mid June it was decided the the fourth infusion wouldn't happen. Some people have tolerated all four infusions, but it is more common for complications to occur after two to three infusions than not. They gave her a very strong steroid to help the liver recover and within a few weeks the liver enzymes returned to normal levels. The second phase of treatment was then able to begin. Nivolumab by itself is infused every other week. In August she began the Nivolumab only infusions. Nivolumab is less strain on the body because it works by making the tumors less able to hide from the immune system. Ipilimumab that was mixed in to start is much harder on the body because it basically makes the immune system uninhibited and can attack otherwise healthy parts of the body. We set up a relationship with the Center for Cancer and Blood Disorders in Fort Worth so that she can get the every other week infusion of Nivolumab done locally. She typically feels very fatigued for a few days after the Nivolumab infusions, but hasn't experienced any severe side effects to this point. The Nivolumab is approved for up to 2 years of every other week infusions and will continue so long as no complications present that would require stopping and there is no progression of disease. Scans at about the three month mark continued to show no evidence of new disease and the tumors were continuing to shrink or remain the same. In the beginning it was thought that she would be undergoing a pin point type of radiation to address the initial brain tumors, but the doctor ultimately decided to wait to see how the response went with the infusion treatment. That was a good call because in early August we learned that all of the brain tumors appeared only as the remains of the dead tissue from the tumors and they were all basically gone. At the three month mark the liver that was previously swelled to almost double normal size was also back to normal size and shape. On October 17th we went to MD Anderson for the 6 month follow up. Scans revealed that the tumors are remaining the same size or still shrinking some. They did identify that a new brain tumor has formed. It was decided that Gamma Knife pin point radiation will be used to treat/destroy the new brain tumor. It is very, very small and the doctor is confident that the radiation will kill it. The first week of November we will be back at MD Anderson for two separate appointments to prepare for the pin point radiation procedure. We expect the procedure itself will be within a week or so following those appointments. Erica is amazing! She returned to work for the new school year and has spent zero moments dwelling on any of this. She is constantly stuck with needles and has been through so many scanning machines that I lost count a long time ago. We have been to the emergency room three times with scares related to severe pain and she just bounces right back. She recently told me that she "will" be an old lady and that I will probably die before her. That is just fine by me and something I look forward to! Treatments referred to as immunotherapy are the most advanced and promising cancer treatments to date and they are finding success with different forms of cancer. The latest research is learning how the malignant cells of various forms of cancer are able to evade the bodies immune system and not be attacked like any other foreign virus or bacteria. The most promising potential is that after immunotherapy treatment the body may "learn" the signature (or antigen) of the mutated cells (melanoma) and be able to address/attack them long term on its own. Ipilimumab was first approved by the FDA for treatment of melanoma in March of 2011. Nivolumab was first approved by the FDA for treatment of melanoma in December 2014. So these are very new treatments that are revolutionary, considering that prior to them there was really no effective treatment of late stage malignant melanoma. Erica's original diagnosis with Stage III melanoma was in January 2010, where she had a malignant mole and positive lymph nodes it had spread to. She went 8 years clear/undetected before this internal/distant spreading occurred. The support she/we have received has been overwhelming and we are very appreciative and feel so blessed. Our little family of four are enjoying our lives and all staying positive while we support Honey/Babe/Mom/Momma. The boys will be 13 and 16 in January. With the obvious stress of cancer we are also living with a learner permit driver regularly behind the wheel! Watch out world! Well, no news is good news in this case going forward. We will definitely update in future if anything warrants. ​6/6/18 - CT and MRI Scans - Fantastic News! We received excellent news this past Wednesday. The first set of follow up scans to compare since I began treatment were done on Tuesday 6/5/18 and the doctor shared the results with us on 6/6/18 that I have no new tumors detected and that all of the tumors are either stable or have shrunk in size! Also, they could only see 5 of the brain tumors (and all brain tumors are smaller) compared to 6 previously, so one of them has reduced is size so much they couldn't detect it or it may have even gone away!! Originally I was told that the response rate to the immunotherapy treatment I'm taking is about 50% of people. The doctor said that the progress I made in 6 weeks is very promising and at the top of the scale for what we could have hoped for. I received the 3rd dose of the Ipilimumab and Nivolumab drugs on Wednesday 6/6/18 after my appointment with the oncologist. In three weeks I will receive the 4th and final dose of the two drugs, and then three weeks later (6 weeks from now) they will do another MRI and CT scan to compare again. Because my immune system has been able to respond to the tumors with the help of the drugs, it is very (highly) likely we can see the same progress continue. After completing the 4th dose of the two drugs, it switches to being a once a month dose of just the Nivolumab for up to 24 months. The Nivolumab by itself has milder potential side effects compared to currently being mixed with the Ipilimumab. The main side effect I've had to this point is fatigue. I also have severe stomach pain some days and itchy skin comes and goes. Absolutely nothing to complain about! I also met with the pain support doctor this trip and he took me off of Celebrex and kept the long acting morphine of 30mg twice a day at the same level. This news has been a huge relief! For the past 6 weeks we haven't known where it was all heading. The support and well wishes from family, friends and loved ones has been overwhelmingly amazing! Thank you and we'll update you when the next set of scans are done in 6 weeks! Love to all! My next appointment at MD Anderson is Wednesday 5/16/18. My Mom is going with me this trip and we will arrive on Tuesday afternoon to be ready for the first appointment at 7:15 am on Wednesday to get blood drawn. I will then see my medical oncologist Dr. Hwu at 8:30 am and then get my second dose infused of Ipilmumab and Nivolumab immunotherapy. We are going to stay the night Wednesday so that I'm close to the hospital for roughly 24 hours following the treatment and then head home Thursday afternoon. When I return 3 weeks later for the third infusion, they will be doing an MRI of brain and a CT Scan of my pelvis and chest. That will be the first time that we see the comparison of tumor information against the original data collected when we found the cancer. I've been able to keep the pain in my abdomen pretty well under control. I eat about 1/2 of what I am used to, but have been able to eat regularly without much nausea. The last 10 days or so I have been able to go about my days pretty well, but taking it very easy with plenty of rest. Harvey plans to return to work on Monday 5/14. He has been with me every day since 4/17/18. It's been nice having a handsome 24 hour nurse on hand...LOL! Thank you babe, you have been amazing! That's it for now. Thank you everyone for all your amazing support! I Love You All! I was discharged from my second hospital stay at MD Anderson today and we headed home after being away for 2 weeks! We still don't know exactly why the drastic pain flair up occurred on Thursday. It's possible the prior liver biopsy was part of it. I was admitted to the hospital again on 4/26 and was discharged 4/30. They kept me on antibiotics throughout my hospital stay and doubled my morphine dose taken daily. My temperature is now consistently reading normal (under 99). I've had a low grade fever of around 100 for the last several weeks and it was as high as 101.8 when I first went back in the hospital. The hot flashes and chill spells I've had for the last 2 weeks stopped as well. During the hospital stay they also started me on an anti-inflammatory drug called Celebrex that I will continue to take daily. The fever being gone could be attributed to the antibiotics or anti-inflammatory med, as well as the immunotherapy helping my immune system to begin attacking the tumors. Who knows, but I feel a lot better. The radiation team reviewed my case on Friday 4/27 and they are in agreement with providing Gamma Knife Radiosurgery to treat/destroy the brain tumors. Ultimately my medical oncologists recommended that I wait for the procedure until we have the new scans that will be taken 6 weeks from the date of the first immunotherapy injections, which I had on 4/21. The radiation team and neurologist were in agreement with his recommendation to wait. With the wait period, if the tumors shrink there is less risk of bleeding within the brain and we can also catch any new tumors that may show up before the immunotherapy was able to kick into high gear. My liver has very severe swelling, so I have ongoing pain that I will be managing. I returned home with all the medications to deal with pain and side effects at this point. Hopefully the tumors on my liver will begin to shrink and the deformity of my liver will be reversed and the pain reduced. Due to the immunotherapy having the risk of causing my immune system to attack things it shouldn't, I have to hope that such side effects are minimal or able to be controlled. As long as I can tolerate each subsequent round of the immunotherapy injections and manage any side effects, I will receive them every 3 weeks with the next dose being on 5/16. The week of 5/14 I will return to MD Anderson for blood work, an appointment with the supportive care team that manages my medications, an appointment with my medical oncologist, and the 2nd round of immunotherapy infusion. The 6 week mark when scans will be performed is also the time frame for the 3rd round of immunotherapy infusion. The goal of the current Ipilimumab and Nivolumab drugs (immunotherapy) is to shrink the tumors and prevent any new ones. Best case scenario would be what is referred to as a "complete response", meaning that my immune system successfully kills off all of the tumors. This occurs in a very small number of patients. I went disease free for almost 8 years, which was exceptional considering the fact that the cancer had spread to my lymph nodes, so I have all the luck and momentum on my side to be a "complete response"! THINKING POSITIVE EVERY DAY!! I'm very lucky that I am dealing with this now and not back within the first several years when I was first diagnosed with the disease, back at that time there were really no treatment options. The boys were able to be with us the first several days when we went to Houston. They also got to come visit this last weekend when my mom brought them down for Friday and Saturday nights (Thank you Mom!). I'm cutting the school year short to focus on living daily with minimal stress and giving my body/immune system all the help I can. There's 4 weeks of the school year left, so I will have missed about 6 weeks of work in all before summer break. I am so glad my amazing friends and coworkers are taking up the slack for me. I know my kiddos are in good hands to finish out the school year. It will also be nice that our boys will be out for the summer and relieve that part of the scheduling consideration for a while. That's it for now. I plan on everything going well over the next two weeks and being geared up for the next trip to Houston. Thank you for the overwhelming love and support provided by so many during this turbulent time. We love you all! Here is a good resource on the MD Anderson website if you would like to know more about Melanoma and the treatment. We made it to the 1:00 consultation with the radiation department today. Unfortunately, Erica woke up this morning in a lot of pain on her right side. By the time we were at the 1:00 appointment her pain was out of control. The Radiation Oncologist made the call to cut the appointment short and send her the emergency room. The emergency room has ordered a CT scan of the chest and abdomen. They want to ensure the pain isn't attributable to the liver biopsy that was done this past Monday. The emergency room doctor also spoke with Erica's primary Medical Oncologist Dr. Hwu, and they have decide to admit her to the hospital again. It's a little after 6pm right now and there aren't any rooms available. As soon as a room becomes available they will transfer her from the emergency room. The emergency room got her an IV going and has been able to get the pain knocked down to a tolerable level. One day at a time, it's simply one day at a time. Unfortunately, it's time to resume the updates here. We want to be sure that everyone we know and love have the opportunity to stay informed about the new status of Erica's journey with Metastatic Melanoma Cancer. Since Erica's last surgery in March 2010, the dozens of follow up appointments were luckily "all clear". About 6 weeks ago she began to experience symptoms that seemed to mimic acid re-flux. This continued and progressed a few weeks ago to the point of pretty severe abdominal pain. On Tuesday April 10th, she visited her local general doctor to discuss the symptoms she was having. The prognosis from that appointment was suspecting a peptic stomach ulcer. She was prescribed Prilosec to control stomach acid and completed a number of samples for lab testing. We were waiting on the lab test results to confirm if there was some form of detail that supported the likeliness that she was dealing with an ulcer. Midday on Monday April 16th Erica was feeling a very sharp pain on her right side just below her ribs. She was also feeling fatigue and dizzy. She went home early from work that day and followed up with the local doctors office. They informed her they were referring her for a colonoscopy and a endoscopy. On Tuesday April 17th we woke up and got the boys off to school. The pain experienced the prior day was persistent and she described it as probably being worse. We went on to the emergency room at Health South in Burleson that morning about 8:30. The emergency team there worked quickly to control the pain and anxiety. About 90 minutes after we arrived they performed a sonogram of the pelvis and a CT scan of the pelvis. The doctor came in to inform us that the CT scan detailed 25 plus lesions on her liver. This was a very sad moment, a moment we will never forget. Because Erica has been a patient at the Melanoma Clinic at MD Anderson since 2010, we were able to immediately contact them. The emergency room doctor also contacted MD Anderson and provided them the test results. Both of our mothers and some of Erica's other family were able to make it to emergency room quickly to be there to support us. The emergency room provided her pain and anxiety medications to help as we moved forward. We arrived home from the emergency room about 1:15. We decided we needed to get the boys from school and inform them of what we found out. We spoke to MD Anderson again within a few hours and they informed us that she could be seen the following day. We took a long nap and packed up for the drive to Houston that night. On Wednesday April 18th Erica had an MRI of the brain and blood work at the hospital. On Thursday April 19th she had another CT scan to cover the portion of the chest that hadn't been scanned at the emergency room back in Burleson. Later Thursday afternoon we had an appointment with a Medical Oncologist at the Melanoma Clinic. This is where we received the sad news that there were 11 lesions detected in the lungs and 6 others detected in the brain. Devastating news to say the least. The decision was made at that appointment to admit her the hospital within MD Anderson. The hospital was able to start controlling her pain and continue blood tests. During the hospital stay the team of Melanoma specialists collaborated to determine the initial scope of treatment to be pursued. They decided to get things rolling to administer a relatively new treatment referred to as Immunotherapy. They also began preparation to administer a type of "pin point" radiation therapy to alleviate/cauterize the brain lesions. Based on blood work results and the history of metastatic Melanoma they are fairly certain the lesions are malignant metastatic Melanoma. The metastatic portion of the description details that the cancer is a result of exposure from the previous malignant tumors found in her lymph nodes back in 2010. The Immunotherapy is a combination of the drugs Ipilimumab and Nivolumab. The first dose was administered on Saturday April 21st and is scheduled to be administered three additional times, three weeks apart. The drugs are intended to stimulate the immune cells and their functions which can attack the cancer cells. There have been numerous breakthroughs in the treatment of Melanoma over the last 8 years, several have become FDA approved treatments. At the time of Erica's original diagnosis there weren't any treatments at all, only that tumors capable of being surgically removed had that option to be dealt with. Although there is the new treatments available, they only serve to try to shrink existing tumors and fight spreading/progression. This is now a disease that must be managed from here on out, but we will never rule out a miracle that 100% rids her body of the cancer. On Wednesday April 25th Erica has additional blood work and an appointment with her primary Medical Oncologists Dr. Patrick Hwu at MD Anderson. You can read more about this amazing man and doctor by clicking here. Dr. Hwu has been out of town since we arrived in Houston, so this will be our first visit with him. On Thursday April 26th she will be meeting the radiology team for her consultation in preparation for the brain radiation therapy that has yet to be scheduled. We are anticipating the radiation therapy will be scheduled within the next week to 10 days. Whew...that's it for now. The outpouring of thoughts, prayers, support, and financial assistance has been beyond belief. We are so blessed and we "feel" the army of support behind us each and every moment. We will try to keep this site updated as often as possible. It's so much less stressful for both of us to explain updated information this way, than it is repeating it and talking about it over and over. The battle has just begun, but Erica is a fighter and every single avenue will be pursued to win this fight. We are blessed beyond our wildest imagination! I just wanted to give a quick update since there are many that may not have heard anything since our last post about Erica's health. Her last check up was this past January and all results were clear. There has been nothing detected since her surgeries in early 2010. She is now on a schedule for a full check up once a year with seeing her dermatologist once in between. After 5 years from diagnosis she will be considered clinically cancer free, although she will continue to have screenings annually forever. Erica was amazing how she was able to pick up after the scare, graduate college, and just finished her 3rd year of teaching elementary school. She feels great, drags me to the gym, and has a very bright outlook on life. Our boys are now 8 and 11 and will be going into 3rd and 6th grades. They get to ride to work/school with mom each day and they love it! Thank you again for all your love and support through a scary time in our lives! It seems like a week doesn't go by anymore without hearing of someone impacted by cancer. We are HUGE advocates of sunscreen and eating healthy. I guess that is really all you can do. I hope this finds you and yours well. For us it looks like roses from here on out, so I will end with telling everyone goodbye from this website, better yet, I hope I never have to be the administrator on a site like this again until we are very, very old. The July follow up at MD Anderson returned 'All Clear' results on the MRI, CT Scan, Chest X-ray, and blood work!! This marks approximately 17 months since diagnosis. Follow ups are now every 4 months instead of every 3. Statistically the risk of recurrence dramatically drops after 2 years and at that point check ups will be extended to every 6 months. Wanted to share the great news that the nine month follow up scans and tests were 'all clear'! Erica ultimately opted for close observation only. The available treatments to deter recurrence have less than compelling statistics and a long list of side effects. She chose to believe that the surgery eliminated all tumors and that her immune system will win the fight with any disease that may have entered her blood. The schedule of follow ups will extend to every four months after the one year anniversary in March 2011. Four month follow ups will continue for two years and then go to six months up through the fifth year. After five years the status will change to 'cancer free' and annual follow ups will continue thereafter. Low dose Naltrexone, Vitalica, multi vitamins, a healthy fruit/vegetable rich diet, and regular exercise are an ongoing focus. Thank you for all your support in getting through what has been a very challenging year! On Wednesday 6/16 reports were reviewed with the MD Anderson doctors for blood work, chest x-ray, EKG, MRI, and CT scans that were performed the previous day. The results were 'all clear' for any indication of spreading. The only detail noted was a small spot on the liver that was dismissed as a cyst but will be closely monitored in future scans. The pathology report from 4/8 surgery returned 4 additional lymph nodes. All of them were normal!! 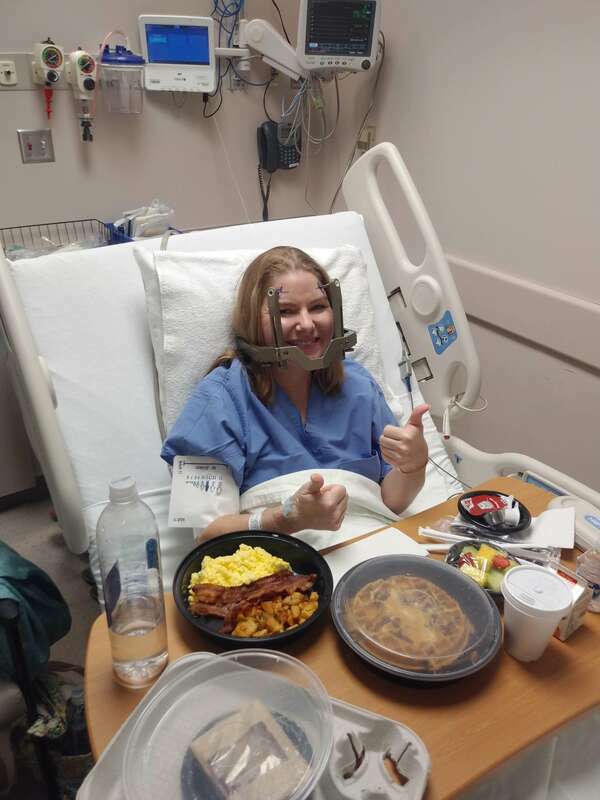 She was released from Harris Hospital in Fort Worth yesterday (Thurs) after having a post-op infection and continues to take an oral anti-biotic. It will take some time to rebuild her overall strength. She will continue seeing a therapist to gain back as much range of motion in her left arm as possible. The attitude from here on out is she is cancer free. A final decision must be made about whether to go forward with close observation only or go ahead with the INTRON A therapy to reduce the chance of recurrence. As noted previously INTRON A is not a very compelling option and as of now she doesn't intend to undergo the treatment. The next scheduled follow up is with the surgeon at MD Anderson on 6/16/10 in Houston. Unless anything significant arises the updates will stop for now. Thank you so much for the encouraging words, help with meals, and all other support offered by so many friends and loved ones. A special thank you to our mothers for all the help with keeping our boys daily routine in tack and our home in perfect order while we have been away. You played such a major roll in getting us through the last 11 weeks! Erica developed a 102 fever Saturday evening. We contacted the surgeon in Houston and he started her on an antibiotic. At that time there were no obvious signs of infection around the surgery area. On Sunday her drainage had turned to a white color, which is evidence of infection, and fever persisted. We contacted the local surgeon on Monday morning and he asked to see her right away. After looking her over he decided to admit her to the hospital to administer antibiotics by IV and better control the pain. By Monday night she was looking and feeling a lot better. This morning (Tuesday) they took out the drain tube and that has further relieved the pain. A therapist is coming today to help her with exercises that will increase the range of motion of her left arm. The doctors expect she will be able to go home tomorrow as long as she can move from IV pain meds to oral and remain comfortable. Erica decided she was ready to make the trip home about 7:00 pm on Friday. She ate soup, salad and bread-sticks takeout from her favorite Olive Garden then we hit the road. We arrived home about 2:00 am Saturday. She did great on the ride home trying to sleep as much of the time as she could. The big bumps hurt pretty bad. She describes the worst of the pain as someone beating her in the chest with a sledge hammer. Her chest muscles and nerves on the left side were moved around a lot during surgery to access the tissue and lymph nodes that were removed. The recliner seems to be her most comfortable place to rest. Her next doctor appointment is with the surgeon (Dr. Crawford) in Fort Worth on Thursday 4/15. This was a previously scheduled follow up for her previous surgery. The appointment will now serve as her post-op follow up instead of going back to Houston for it. Hopefully the drain tube will be able to come out that day. The ON-Q pain pump appears to be almost empty. It was supposed to supply 48 - 72 hours of numbing medicine internally over the affected area. We will be able to remove the pain pump catheters at home when the medicine reservoir is completely empty. Surgery check in was 9:30 am on Thursday and surgery began about 11:30. It lasted a little over two hours. The surgeon reported he removed quite a bit of remaining tissue and at least a few additional lymph nodes. We left the hospital at 9:30 am Friday to go back to the hotel. She has a drain tube and a catheter that is infusing a numbing medication directly from a pump worn in a pouch held by a shoulder strap. The pain has definitely intensified since being off of the IV meds but she is doing great. This afternoon is the first time she has felt any nausea which is probably from several oral doses of pain pills after leaving hospital today. The MRI results from Tuesday's scan returned clear. The pathology report from surgery is expected in seven to ten days. We will head home as soon as she feels she can. The surgery follow up will be at home with Dr. Crawford. He will remove the drain tube when drainage is below 30cc in last twenty four hours. Whether or not there are additional positive nodes from the pathology report will weigh heavily on whether she chooses to go ahead with INTRON A treatment or with observation alone. The MD Anderson surgeon would like to see her in 3 months and then every 6 months thereafter. She will continue to see the local Oncologist in Fort Worth on a very regular basis for the first couple of years. For another set of eyes she will see the MD Anderson Medical Oncologist when making the trip to Houston to see the surgeon every 6 months. The surgeon told us in Wednesday's pre-op consultation that he expects the pathology report will be negative. He offered that pending those results he personally would not undergo INTRON A therapy as the benefits are very vague for the long list of side effects (he reluctantly discusses this and regularly says he prefers to leave drug therapy topics to the Medical Oncologist). He made the comment that he would support an observation only decision and suggested she get on with life with the attitude that she is cancer free. Decided on additional surgery to remove any remaining lymph nodes and fatty tissue that Dr. Lucci (Surgical Oncologist at MD Anderson) sees necessary. Leaving today for MD Anderson...4/6 is MRI of brain, 4/7 pre-op, 4/8 surgery. Blood work returned a different DNA type than what's required for the proposed clinical trial. Traditional Intron A therapy is the only current option. After recovering from surgery and finding out if there were additional positive nodes we will give Intron A final consideration. When weighing the risks and side effects it is very hard to see the benefit. The drug company quotes statistics from the FDA trial that approved the drug as having 66% of patients suffering adverse reactions, 14% suffering life threatening reactions, and 96% as having severe fatigue. The benefits are quoted as reducing the likeliness of recurrence by 10%. Met with Surgical Oncologist Dr. Anthony Lucci. He recommended another surgery to remove remaining lymph nodes under left arm. He stated this is standard practice at MD Anderson to remove them all and I only had the lower removed. His concern is any remaining nodes could also contain tumor, although he felt there to be less than a 10% chance any of them would be positive. Sort of a better safe than sorry perspective. I contacted Dr. Crawford (the vascular surgeon that previously removed nodes) and asked him to call Dr. Lucci to discuss the matter. Dr. Crawford doesn't feel the additional surgery is necessary. We're hoping the two doctors can agree one way or another so that it will make it easy to know what to do. Surgery is tentatively scheduled for Thursday April 7th awaiting additional feedback. We also met with Medical Oncologist Dr. Patrick Hwu. There is a clinical trial available that has shown very good results. You must have a certain DNA type to be enrolled (which approx 40% of people have) in the trial for which blood was drawn to test for. The trial would use pegylated interferon alpha 2-b along with a peptide Melanoma vaccine. In the previous study the same vaccine was used with a stronger drug similar to interferon called interleuken-2. The new clinical trial using the vaccine with interferon may achieve similar results which hopefully would reduce chance of recurrence much better than interferon alone. If DNA is not a match for the trial standard interferon is the only other option. We mentioned the shorter 30 day regiment of interferon verse the full 12 months and Dr. Hwu felt there's not enough evidence supporting the theory and would fully recommend as much of the 12 month treatment cycle as can be tolerated. Dr. Hwu also recommended a CT Scan and MRI of the brain. The MRI is required to be enrolled in the trial. Both Dr. Lucci and Dr. Hwu are experts in the field of Melanoma research and treatment. By many they are regarded as the best in the Western Hemisphere. MD Anderson definitely offers a comprehensive approach. Going forward they will be consulted for all treatment considerations. If it's decided to go forward with the additional surgery it will be done by Dr. Lucci at MD Anderson. If approved, the clinical trial will be administered at MD Anderson every three weeks and would start as soon as possible. Dr. Crawford (Vascular Surgeon who performed lymph node disection) offered feedback from the tumor conference he attended where he presented my case. He reaffirmed the opinion that interferon is the only obvious adjuvant treatment to help stop or slow recurrence. Several specialist at the conference shared that recent studies show the 30 day high dose intervenous interferon treatment alone offers substantially the same results in detering recurrence as patients that undergo the current standard of 12 months of treatement, where the last 11 months are lower dose self injection. Dr. Crawford noted that approximately 75% of those attending the conference informally voted to be in agreement with the theory. Dr. Crawford contacted the local Oncologist Dr. Xiong with this feedback. Dr. Xiong will also receive follow up information from the MD Anderson assesment. All information will then be considered during a 4/9 appointment with Dr. Xiong in making a final decision about treatment to deter recurrence. Vascular Surgeon Follow Up Visit, Etc. The drain tube came out today and incision is healing well! Dr. Crawford is attending a tumor summit this Wednesday where he is going to present my case for feedback from peers. He will call me if there is any meaningful feedback and I have another follow up with him in 3 weeks. I have everything gathered for MD Anderson Trip on 3/31. Time to play catch up on school and work. Harvey surprised me with making our trip to Houston a mini vacation. We are going to Galveston after we leave MD Anderson to stay at The San Luis Hotel for 2 nights...which will include the night of our 10th anniversary (4/1)! The hotel is on the seawall overlooking the Gulf. We stayed there with our boys last spring break and it was fabulous. Metastatic Malignant Melanoma was found in one of eight lymph nodes removed during 3/15 surgery. Metastasis (tumor) measured 0.8 mm. Sentinel Lymph Node Biopsy performed during previous surgery returned one lymph node with metastasis (tumor) measuring 0.43 mm. The quantity and size of tumors may give the Oncologists an indication of how extensive the spreading of melanoma cells in her blood is. Removing the axillary lymph nodes was the last available surgical step in trying to deter distant spreading. Follow up with vascular surgeon has been rescheduled for Monday 3/22 awaiting drainage to reduce to less than 30cc per 24 hours. ​Erica's second night of rest after surgery was much better. She described her pain this afternoon as a 5 on a scale of 1 to 10 (she described as 9 in recovery area after surgery), which I must say she tollerates very well. She had some nausea this morning and was sick one time, probably from the pain pill doses overnight without food. Drainage remains consistent at 100cc per 24 hours. Follow up appointment with surgeon will probably be postponed until Monday 3/22 as the drainage needs to be below 30cc per 24 hours to have drain tube removed. She is eating well and drinking a lot of fluids. Broccoli sprouts are the most effective vegetable in helping the immune system with regards to various types of cancer. They are noted as having 20 to 50 times the cancer fighting properties of the next best vegetable. Sulforaphane has been identified by many scientists as the strongest known inducer of Phase II enzymes. Phase II enzymes have the ability to neutralize the chemical toxins, electrophiles and free radicals, that are responsible for the initiation of carcinogenesis. This enhancement to the bodies’ immune system is a proactive step for Dietary Chemoprotection. Erica will be adding Vitalica to her daily supplements. Vitalica contains 30 mg of sulforaphane glucoraphanin in a single gell capsule, taken once daily. Today's commercially grown broccoli and broccoli sprouts have very inconsistent levels of sulforaphane glucoraphanin. It is thought that you would have to eat 2 - 3 pounds a day of broccoli sprouts to achieve consumption of 30 mg. John Hopkins University patented the seed that is used to grow the broccoli sprouts that Vitalica is comprised of. Extensive research has consistently shown Vitalica to dramatically increase the level of sulforaphane glucoraphanin in the body. Journal of our journey with a Metastatic Melanoma Diagnosis. Erica was diagnosed Stage 3 in January 2010 and then Stage 4 in April 2018.